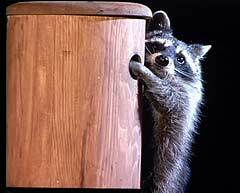 While Native America was busy designing nest boxes for birds, raccoons were busy emptying them out. Raccoons are nocturnal mammals that prowl the moonlit woodland paths. They are very adept at climbing trees, wooden fences and metal poles to get to the nest boxes. Once at the nest box, raccoons explore the inside of the cavity with their agile hands. 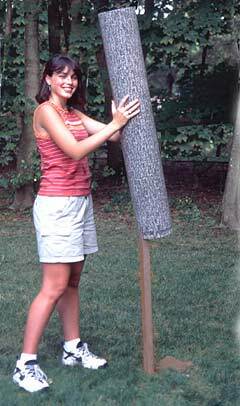 Its arms can extend deep into the nest box feeling for eggs or young birds or incubating parents. 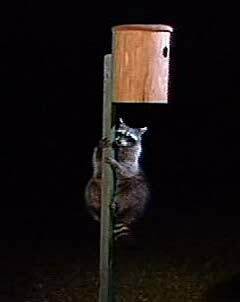 Lucky raccoons get a feathered meal. Unlucky birds say goodbye to their last night in the nest box. Telltale signs of raccoon predation are nest strewn and hanging from the nest box. Also often evident are the scratch marks of its claws on the wood under the entrance hole. 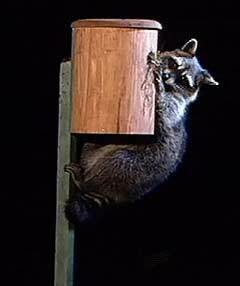 Native America needed to include in its plans a method to keep the raccoons from disturbing the nest boxes. After trials of research with different materials and sizes and shapes, the most suitable and effective deterrent was a hollow plastic tube. To make it blend into the woodland setting it was imprinted with a white oak bark pattern. 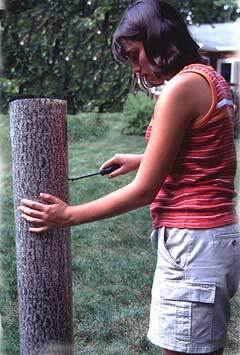 This "Tree Mirage" raccoon guard could now be slipped over a wood or metal pole and fastened to it by screws or bolts. 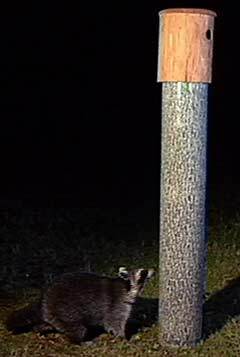 Now with the nest boxes propped atop a "Tree Mirage" the raccoon is stymied. The birds can sleep in peace at night as they incubate and warm their young. 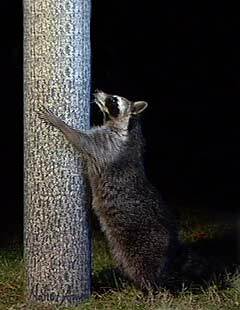 Try as he (or she) might, the raccoon simply cannot grasp or grip the wide and slippery "Tree Mirage". No harm is done to the raccoon as he moves on. And no harm is done to the nesting birds as they doze and dream. The Tree Mirage also has the added advantage of being resistant to squirrels. 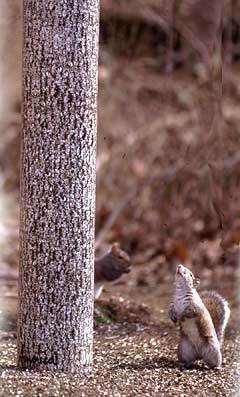 If one wishes to keep bird seed safe from squirrels a bird feeder can be placed on top of the Tree Mirage. If one wishes to feed the squirrels, however, food for them can be placed on the ground below the Tree Mirage. 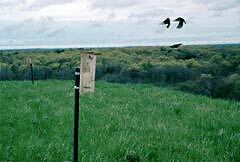 Native America initiated a cooperative effort with the Town of Oyster Bay, NY in 1996 to put up nest boxes for Bluebirds and Tree Swallows on one of the capped landfills in the town. 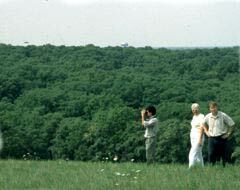 Native America provided field and design guidance and, together with the town, put up 100 nest boxes on the grassy hills. This site has proved invaluable for ornithological studies. The area is desolate, secured from vandalism and inviting to cavity nesting birds. 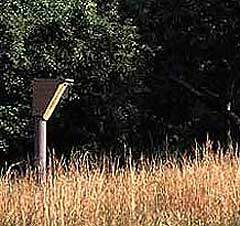 The town has taken an interest in the site as a wildlife refuge and the site has become one of Native America's prime research locations for variations on nest box design. Monitoring of the nest boxes is shared between the town and Native America. 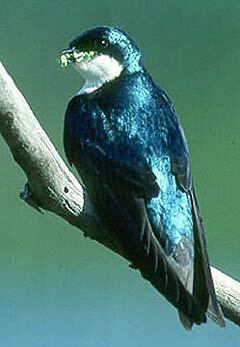 Tree Swallows are among those birds that are harassed and killed by the aggressive house sparrow. In an effort to explore alternative nesting structures that might diminish the use by house sparrows, one hundred nest boxes were put up on a landfill with the cooperation of the Town of Oyster Bay. The first part of the study is primarily concerned with the adaptability and breeding success of the native tree swallows. While there are house sparrows in the area, none were found in any of the nest boxes. However, the study site chosen is a remote elevated field and it may be that the house sparrows would not venture there anyway. This aspect will,in turn, be explored. 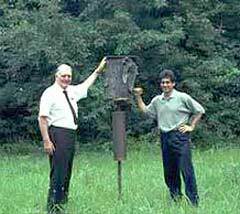 Native America began the research for the Woodpecker Nest Box in 1994. The first prototype was a clumsy section of a hollowed out log propped up on a painted cyclone fence post. A crude rounded piece of plastic was attached to the front entrance hole. While the early prototype worked, starlings were still able to get in from time to time. It was only after years of experimentation that the shield was fine tuned to just the right size and dimension. It was also important to shape the nest box to conform just right to make the whole thing work properly. Native America continues to field test the Woodpecker nest box throughout North America. It is important to broaden the range of woodpecker species that will use the nest box. It is also important to study the territorial ranges, migratory dispersal, and habitat preferences with this concept. 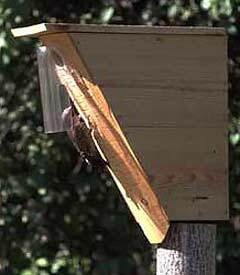 In 1999, the Woodpecker Nest Box with the inclusive protective shield became available for private and public use.